Situated about 30 minutes from Lyon, this site is the archeological witness to how these agricultural domaines, formerly belonging to monks, used to be. Today this property has been in the same Lyonnaise family for 3 generations. If the origins of this site are hidden within the Middle ages, nowadays fantasy, literature, and ancestry are each bound to this building full of History and Stories. The buildings are grouped around an inner quadrangle and fully integrated into the sloping terrain.They have lived through transformations to render them more practical for today's living. 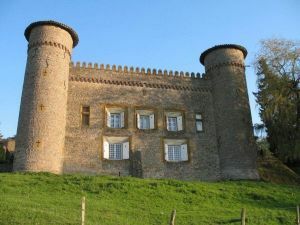 The whole consists of a castle with 2 North towers giving a view of the Beaujolais and Lyonnais hills, a chapel and a farm, part of which is converted into an inn. Anything of the past that could be has been carefully preserved : antique tiled floors,wooden floors, latticed ceilings, monumental fireplaces, a forge and a bread oven. The stables have been allowed to slumber but still carry traces of their former wealthy peasant owners. One slips from one building to another through alleyways in the cool of the gardens. Here the walls have ears and also divulge their own secrets. The gardens of over 100 hectares have been worked up at different times. Facing west they are surrounded by a small boxwood hedge. To the east of shower of blossoms and flowers can be enjoyed from season to season. Every spring visits are organised. The panorama, boasted of by numerous writers, has been compared to the Tuscan countryside. On this delightful spring day with the sun shining warm after winter, let us take a moment ... centuries -old and sumptuous. The asking price is 2 500 000 euros.